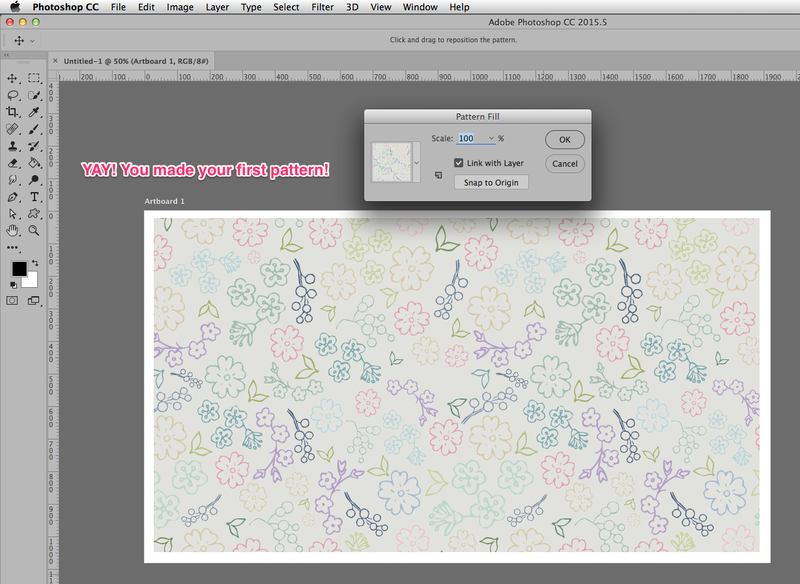 This tutorial will help you create your own seamless patterns from scratch. 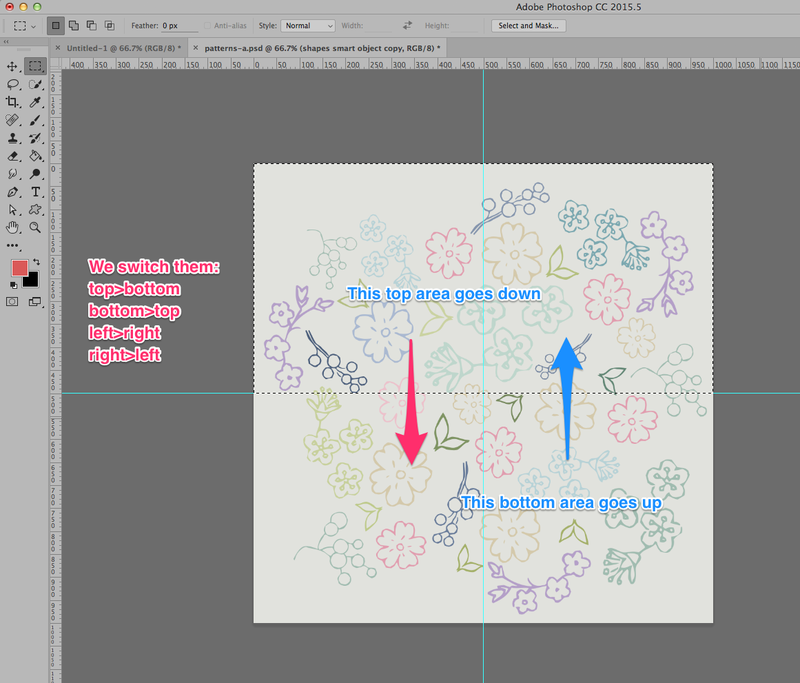 I’m including a floral shape palette that I made in Illustrator. 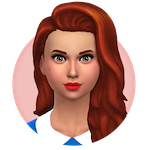 You can use my .psd to follow the tuto and/or in your own creations or CC making or recolors or whatever your heart desires. A shout back is appreciated but not required. 4. Open the fly-out menu and select Replace Shapes. Go to where you saved my custom shape palette and select it. Now you’ll have all my custom shapes loaded and you’re ready to start. 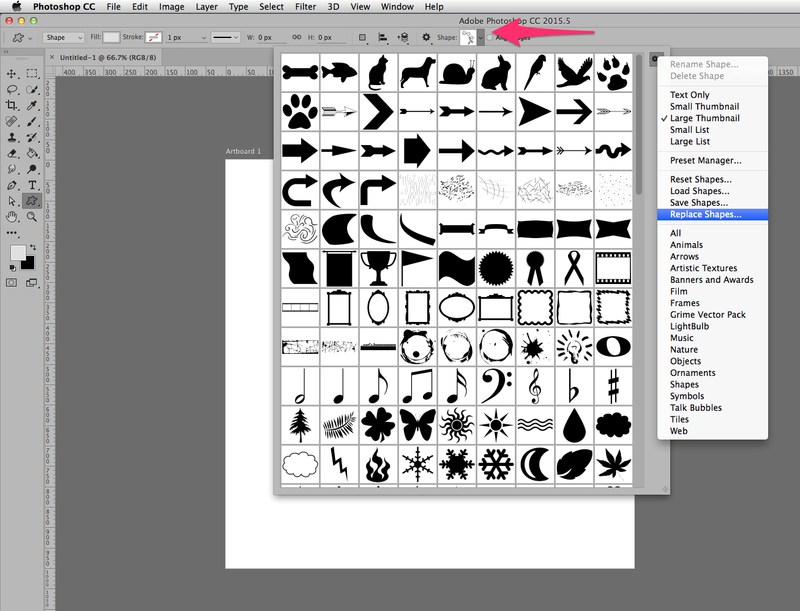 Note: the shapes are also inside folders in the layer panel, with labels for easy access. 5. Open the shapes palette, click on the shape you want to create, hold shift and drag in your artboard. You will see that a new layer was created in your layers panel. If you want to create a new shape, de-select all layers or create a new one and repeat the step above. If you create a new shape while a layer is selected, if will place your new shape inside and while this may be good for some kind of work, for patterns, where you’ll be repeating, copy/pasting and resizing shapes, it’s better to create in a new layer. 6. Keep doing the above step until you have all the shapes you want to use in your pattern. 8. Start placing the shapes in the artboard. Don’t place things to close to the edges and nothing should go over the edge; keep repeating and using various colors and sizes until you happy with the look. 10. Grab this group (the folder), hold the option/alt key and drag it above it to make a duplicate; hide the original group by clicking on the eye icon; open the duplicate you just created, select all layers (shift to select multiples layers) and hold control and click on top of these layers, select Convert to Smart Object. This means that you’ll have all these shapes saved inside a single layer that you can still edit if you click on it 2x. The original group also will be save inside the first folder your created. 12. Select the marquee tool and on the smart object layer you created above, drag the marquee on the top half of the image > press command + J keys. A new layer is created above with only the parts selected via marquee. Do the same for the bottom part: go to the smart object layer, drag the marquee on the lower half of the image > press command + J keys. 13. Hide the bottom layer and the smart object layer and move the top layer (shift+arrow key) to the bottom. Be sure that this layer won’t move left or right nor leave a gap or go over the edge. Zoom in to have a better look. If “overlaps” or a gap happens, your patterns will look like it missed a line. Use the shift key to make the layer move faster (more jumps), but when you’re close to the edge, use only the arrow key so you can see when it gets lined perfectly. 14. Do the same for the bottom layer, move it to the top. Careful with the edges again. 16. Select the marquee tool and on the layer you created above, drag the marquee on the left half of the image > press command + J. Do the same for the right side: marquee the right side, command + J key. 17. Now you’ll move the left part to the right and the right to the left. Always mind the edges! Once they are in place in opposite sides, select both and press command+E. You may want to lock this layer clicking on the lock icon on the layer panel. That way it won’t move accidentally. You’ll end up with something like this. 18. Now fill the middle parts following the same flow you did before. 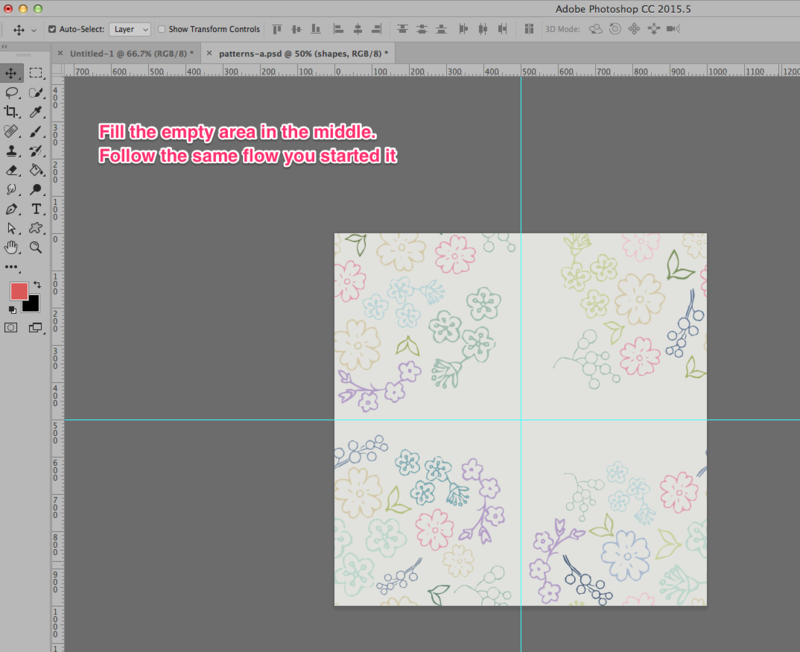 The more filled your artboard was before you did the FLIP, the smaller will be the area you’ll need to fill now. 19. Once you’re done filling, your pattern is ready. You can save this as a working artboard, meaning you can still change the colors, size and placement of the smart objects you saved to create a variation of this pattern. You’ll have to re-do the flipping side, off course, but if you don’t delete or merge these layers you’ll always be able to work on them. 20. 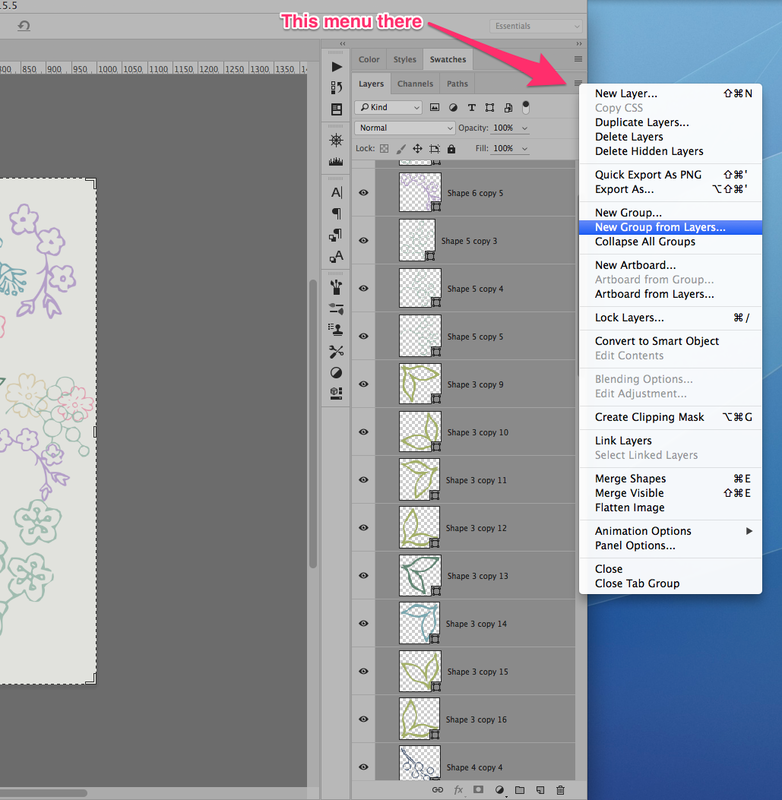 To add the pattern to your swatches: go to menu Edit > Define Pattern. Test it in a bigger canvas to see if you’re happy with the results. - Tight spaced patterns make repetitions less noticeable. - Pay attention to scale. Don’t use big size variations in the same pattern. 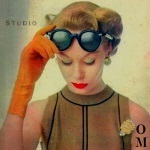 It will make some shapes grab more attention than others and your eye will notice the repetition right away. Go for a good balance. - Pay close attention to the space between the shapes. Try to make the spacing similar around all the shapes. - Start from the center and build towards the edges. It may look weird when you start, but keep filling it in, using a slight size variation, rotating and changing colors and you’ll get there. My pleasure. I feel it's only fair to share a bit of what I know with the community that helps us all so much. Thanks for this, I could never make any from Adobe Photoshop but I can now with your tutorial! Yay! Glad the tuto helps.